Lisa Hendey, founder and editor of CatholicMom.com and author of The Grace of Yes: Eight Virtues for Generous Living, offered a workshop at the University of Dallas Ministry Conference (UDMC) Friday, Oct. 24. Her session “Solving the Social Media Mystery” provided listeners with “tips, tools, and techniques for the new evangelization” using the power of the Internet. Throughout her presentation, Hendey explained why Catholics should effectively embrace the use of social media within their churches, schools, and campus ministries. Social media tools such as Twitter, YouTube, Instagram, and Facebook, she said, can help increase activity within the Church, and strengthen the faithful. Hendey added that clergy, including Pope Francis, use social media to reach vast numbers of people. Hendey added that using social media for the new evangelization comes with responsibilities. Hendey emphasized the importance of praying before using social media to represent the Church. “If you’re just starting to use these tools for your organization — or even personally — I’d ask you to spend some time in prayer and discernment about why it is that you want to do this,” she said. She also suggested involving the community in social media efforts, experimenting with new social media platforms, observing what other communities are doing, and being creative with Internet posts. Hendey later added that the Internet is in an ever-changing mode, and will always have new additions to its platform. Brother Pedro Romero, who works in youth ministry at Our Lady of Guadalupe Catholic Church in Fort Worth, found the session very helpful. He said he now has a better understanding of the importance of social media, especially as it relates to the youth of the Church. Velma Smith, a catechist for 30 years, attends the University of Dallas Ministry Conference (UDMC) for one very important reason. “Our religion is an ever-learning religion,” says the St. Bartholomew parishioner. “You can never grasp all that the Catholic Church has to offer.” The largest Catholic ministry conference in the Southwest gives Smith the opportunity to hear nationally-recognized speakers, network with other teachers, and pick up books and ideas she can use in her classroom. Anna Scally, president of Cornerstone Media and an award-winning youth ministry performer, artist, and author, spoke at the University of Dallas Ministry Conference Friday, Oct. 24 in the Marriott Las Colinas Ballroom. Her presentation, “Think Outside of the Pew” provided listeners with outreach strategies she finds effective in youth and young adult ministry. 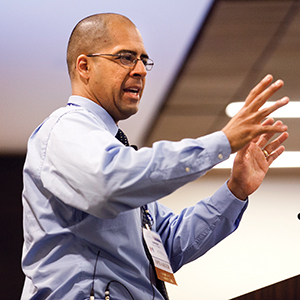 Diocesan Director of Adult Catechesis Marlon De La Torre presented his session “Before You Go: 10 Things to Consider Before Leaving the Catholic Church” at the 2014 University of Dallas Ministry Conference Saturday, Oct. 25 at the Irving Convention Center. His hour-long presentation centered on charitable ways to approach Catholics considering leaving the faith. Father Robert Ruhnke, CSSR, a experienced marriage preparation consultant, stunned his audience with some startling statistics at the 2014 University of Dallas Ministry Conference (UDMC) held Oct. 23-25 at the Irving Convention Center. According to some research studies, the average length of marriage in the United States is 18 months. Rethinking the way couples prepare for marriage could change that trend, according to the noted author of For Better & For Ever, a resource handbook for the newly-engaged.